What was the big deal behind the Kepler news conference yesterday? It’s not just that the number of confirmed planets found by Kepler has more than doubled (though that’s certainly exciting news!). What’s especially interesting is the way in which these new planets were confirmed. Before Kepler, the way we confirmed planet candidates was with follow-up observations. The candidate could be validated either by directly imaging (which is rare) or obtaining a large number radial-velocity measurements of the wobble of the planet’s host star due to the planet’s orbit. But once Kepler started producing planet candidates, these approaches to validation became less feasible. A lot of Kepler candidates are small and orbit faint stars, making follow-up observations difficult or impossible. This problem is what inspired the development of what’s known as probabilistic validation, an analysis technique that involves assessing the likelihood that the candidate’s signal is caused by various false-positive scenarios. Using this technique allows astronomers to estimate the likelihood of a candidate signal being a true planet detection; if that likelihood is high enough, the planet candidate can be confirmed without the need for follow-up observations. A breakdown of the catalog of Kepler Objects of Interest. validated, and another 455 have FPP of 10–90%. Probabilistic validation has been used in the past to confirm individual planet candidates in Kepler data, but now Timothy Morton (Princeton University) and collaborators have taken this to a new level: they developed the first code that’s designed to do fully automated batch processing of a large number of candidates. In a recently published study — the results of which were announced yesterday — the team applied their code to the entire catalog of 7,470 Kepler objects of interest. The team’s code was able to successfully evaluate the total false-positive probability (FPP) for 7,056 of the objects of interest. Of these, 428 objects previously identified as candidates were found to have FPP of more than 90%, suggesting that they are most likely false positives. In contrast, 1,935 candidates were found to have FPP of less than 1%, and were therefore declared validated planets. 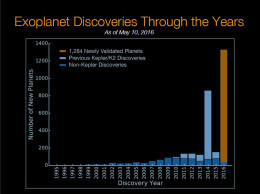 Of these confirmations, 1,284 were previously unconfirmed, more than doubling Kepler’s previous catalog of 1,041 confirmed planets. Morton and collaborators believe that 9 of these newly confirmed planets may fall within the habitable zone of their host stars. While the announcement of 1,284 newly confirmed planets is huge, the analysis presented in this study is the real news. The code used is publicly available and can be applied to any transiting exoplanet candidate. 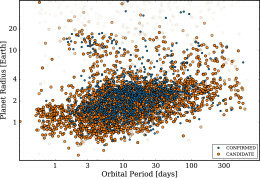 This means that this analysis technique can be used to find batches of exoplanets in data from the extended Kepler mission (K2) or from the future TESS and PLATO transit missions.